The shenanigans over Brexit as reported say that we are stuck over the issue of the Irish border. Trying to investigate what was meant by this brought me up against the usual fog of reportage sans cerebration, when what one wants is the presentation of the problem. This is how I understand the problems, where I use Ireland to mean the geographic island, Ulster (rather than Northern Ireland) to mean the 'nation of Northern Ireland within the UK’ ¹ and Eire (rather than Ireland) to indicate the political state republic that is a member of the EU in southern Ireland. • The only land border that the UK has with the EU lies on the border between the two parts of Ireland. • Both parts of Ireland want no return to a hard physical border within its coast. Indeed, the political statements from UK, Eire and the EU all say they wish there to (continue to) be an invisible border. • The EU insists that there must be a border, so there are some options: (i) the border goes at the edge of the EU (ii) despite what the Ulstermen say, the border goes on the Irish sea coast leaving no discernable border on the island (iii) some fudge state between the two, possibly amounting to borders at all coastal points on the island but with free movement within the island, possibly moving the whole of border issues to off-island places. • The political parties within Ulster include many which are vehement rejectors of reunion within the island, drawing the line at any more integration than has been occasioned by membership of the EU. There is assumed to be a significant fraction within Ulster, possibly an absolute majority, who wish to remain part of the United Kingdom. (a) Many, the EU included, would like there to be no passport checks. The consequent worry is that Ireland then becomes a target for EU immigrants wishing to move into the UK. (b) Those responsible for exercising customs regulations say that the invisible border is an impossibility. Maybe there is room for a distinction between people and goods. Among the problems is that the EU rules demand there be a border — it is a border of the EU, so it must exist physically. This obviously conflicts with the earlier political statement of wishing the border to remain invisible. (c ) the prospect of there being checks on all freight crossing the border within the island produces mass rejection, much as it does on the UK mainland. (d) Having passport controls at Ulster airports lowers the status of Ulstermen who are British; it is an attack on their Britishness. (e) one significant worry is that returning to a hard border is predicted to return the Troubles. (f) it does not, on the face of things, seem possible to keep to the commitments to leave the customs union and to leave the single market while at the same time having no border within Ireland. Here’s a quote from Bloomberg: Both the EU and the UK agree that Northern Ireland needs what they call a specific solution. There are two difficulties with this. First, so far, they have failed to agree on what that solution might look like. The EU, heavily influenced by the Irish, has suggested that Northern Ireland could play by the same rules as those operating south of the border; the UK has yet to lay out in any detail what its interpretation might be. Second, any bespoke answer for Northern Ireland will have to be acceptable to the Democratic Unionist Party, or DUP, which props up May’s government in Westminster. The DUP is adamant that Northern Ireland will leave the EU on the same terms as the rest of Britain. (g) the Belfast “Good Friday” Agreement confers or confirms that: the permanent birthright of the people of Northern Ireland, irrespective of Northern Ireland’s constitutional status: to identify themselves and be accepted as British or Irish or both, as they may so choose; to equal treatment irrespective of their choice; and to hold both British and Irish citizenship. I see this as a source of concern for some so as to become European by moving within the UK to Ulster. But note the good Friday agreement says birthright. (h) in order to have any sort of invisible land border within Ireland, there must be a high degree of compliance within the customs rules and regulations – in effect it will be required that what I am calling Ulster remain—and continue to remain—within the customs union. In effect, Ulster would indeed Remain, because that is the only way there can be no border. The difference between 2019 and 2016 would be there being no say whatsoever in what it is that the regulations are, or become. That strikes me as very close indeed to separation, to dis-unification. I see no benefits whatsoever in becoming a satellite of the EU, bound to it inextricably, obliged to follow its rules and yet completely unable to have any say in what those rules are. But it seems impossible to provide any other solution for Northern Ireland short of separation, to which they have no reason—yet—to agree. This is uncomfortably like having a divorce and then telling (not asking) one child which parent it will be living with. (i) what can be called trusted trader status, allowing those so designated to cross largely unhindered (but presumably with spot checks). (ii) moving border checks to airports and ports, not necessarily in Ireland. Examples would be French police doing checks in Dover and British police in Calais. See Guardian article (source 2 perhaps). The bad news in this scenario is that basically it downgrades Ulster within the UK Union. At the same time it pushes Ulster into the hands of Eire and the EU, encouraging breakup of the Union. (iv) moving the border to somewhere on the edge of the Irish sea. Meaning probably the outgoing border in each direction. This undermines the status of Ulster and creates a barrier to trade within the UK. (v) some fudge that leaves no tariff on goods travelling across the Irish border. BAD news; UK does that to one country as trading partner (in this case, the EU) then it must do so (under WTO rules) to ALL countries in the WTO. That is no tariffs to anyone. Not impossible, just unlikely. See sites sources 6 & 7 for a write-up. A streamlined customs arrangement between the UK and the EU underpinned by the continuation of some of the existing agreements and under which the UK and EU would trade with each other as third parties. Such an arrangement is essentially an agreement to reduce, as far as possible, customs checks. Such agreements are common and can be included as part of customs union or free trade agreements. (vi) turning the whole of Northern Ireland into a free-trade area. A wonderful thing to pull off. Quick, buy some property there. Basically, somebody wants both the cake and the right to eat it. Oh, apparently that’s most of us. Dare I suggest that to a large extent, the English don’t care about Northern Ireland? Pretty stupid, but we do agree with the right to self-determination, which therefore allows the people of the Irish bit of the UK to decide that they wish to be in the UK. While they continue to do that, we others in the UK must help that state exist. No, you can’t have self-determination for just your estate, though I am sure you could find some politicians willing to agree to let you try, for a price. No you can’t decide on behalf of others within your nation, despite the extent to which I’d happily let London leave the Union to the same extent as Northern Ireland or Scotland, but that is really devolution, not disbanding the union. I have long thought that this alone was reason enough to say that Brexit was not something one wanted to happen. If not returning to a troubled Ireland has, as its price, staying within Europe, then I say that is a fair price even for those who dislike a lot of what Europe stands for. I am told that what Brexit is ‘really' about is control — control of immigration, control in the courts (ECJ especially). But we have not made enough effort to decide what we mean by unwanted immigration — or even what it is we mean be desirable migration of any sort. I suspect that in the months since the Brexit vote some of us have begun to discover what it is that we now mean by immigration we do not like. I also suspect that for many that reduces to something not too far from wanting to feel that their idea of Britain has not changed too much. To a large extent it is our fault for living in a place that others wish also to live in. I suspect that too many of us are looking for something for nothing; some appreciable gain for zero work. That is what a migrant sees a Brit has having for the delightful ownership of a residence permit – access to the wonderful facilities that are extended in Britain Which is fine, provided we can afford that. Which in turn means that we require each migrant to in some sense ‘pay their way’. We cannot reject the Brits who refuse to work, to learn, to have ambition, to work—write your own list of desirables—but we can reject migrants with those missing qualities, once we have determined what they are. We can also encourage Brits in numbers to migrate. We had all of this within the European Union. What we did not have was some very ill-defined sense of control of our own destinies. By demanding the return of that, we are collectively discovering the costs attached to such a desire. Many who voted Remain saw that position. Many who voted Leave were wooed by false promises and short-term gains. We are all the losers here and not least what we have lost is any faith that any published information has worth. Not just Fake News but, worse, that all news must be to an extent fake. We have few (I want to write no) ways of testing any statements for truth. We are suddenly reduced from a technological society to one where faith or belief is paramount. Re-reading this in May 2018 I see no progress at all and nothing to change. I find that quite depressing. Politically, the DUP is disinterested in yielding any tiny space and so will veto anything, and apparently everything. The EU, meanwhile, adopts whatever the Eire position is – understandable, though surely there is a need for some pragmatic external approaches to come from the EU and London. Self-determination remains a key issue, hand in hand with all references to the Good Friday agreement. Which is only repetition of what I wrote in December. It had occurred to me, long before writing the 2017 piece, that one interpretation of the intra-EU migration rules was that anyone can move anywhere (free movement), provided they hav a job to go to. That is, we could move the rules just a bit, such as liability for National Insurance and certain sorts of taxation, so as to not limit freedom of movement but make sure that the nation doesn’t give freebies. We could have instituted border checks as a security measure: of course you may enter if you’re a European, we just need to know who is coming in and going out. Added to this we could do things like chipped passports so that a good deal of the border transits are no slower than ‘free movement’ implies. To put this another way, we could have got on with many of the ideas required for the seamless internal Irish border and applied them at all border points for the UK. I remember a faint suggestion that this was doable back in the period when Cameron was doing the rounds trying to make European governments understand that this really was a serious business; they poo-pooed it then but now the attitude is more nearly ‘not our problem’. As ever, they will be right, but onlyu if UK sinks into economic obscurity. If we were to turn instead into the Japan of Europe, they’ll regret that reaction. 1 Ulster is not Northern Ireland but a superset of it. Ulster has nine counties and Northern Ireland is only six of those. Donegal, Cavan and Monaghan are in Eire as shown the top image from wikipedia. The remaining counties that would form border are Armagh and Louth on the east and Sligo and Fermanagh on the west. Ireland is divided into four provinces, each made up of counties, where the other provinces are Connacht, Leinster and Munster. Thus Eire is the three provinces Connacht, Leinster and Munster plus the three counties of Donegal, Cavan and Monaghan. Ulster has a population of 2 million people, half of which lives on the coast nearest England, in Antrim and Down. The three Eire counties of Ulster has (only just, at 8%) a catholic majority in the population. 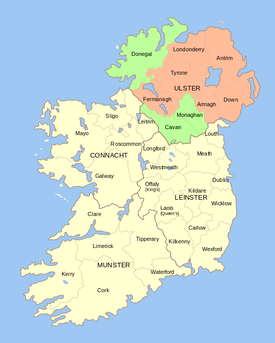 The population of the three Eire counties in Ulster is about 200,000, 10% of the total for Ulster. The EU is by far the country's largest trading partner, accounting for 57.9% of exports and 60.7% of imports. The United Kingdom is the most important trading partner within the EU, accounting for 15.4% of exports and 32.1% of imports. Outside the EU, the United States accounted for 23.2% of exports and 14.1% of imports in 2010. Ulster’s exports (HMRC figures) are 52% to the EU, including 38% (⅔ of all to EU) to Eire. the single market  You can be in the EU's Single Market, but not the EU; this is what Norway, Iceland and Liechtenstein do. The European Union's single market is perhaps the most ambitious type of trade co-operation. That's because as well as eliminating tariffs, quotas or taxes on trade, it also includes the free movement of goods, services, capital and people.That is why there has been no limit on the number of French people who can come to the UK, or the number of British people who can live in Spain - but there are limits on Turks or Ukrainians, for example. Also, a single market strives to remove so-called "non-tariff barriers" — different rules on packaging, safety and standards and many others are abolished and the same rules and regulations apply across the area. the customs union  The EU is not only a single market — it is also a customs union. The countries club together and agree to apply the same tariffs to goods from outside the union. Once goods have cleared customs in one country, they can be shipped to others in the union without further tariffs being imposed. If the UK left the Customs Union but stayed in the single market, our exporters would have to contend with what are called 'rules of origin’. These rules are designed to demonstrate that goods that legally originated in the UK—and did not contain more than the maximum permitted level of parts and components from elsewhere—qualify for duty-free entry into the EU. There are allegedly three ‘big’ issues within Brexit: the Irish border, citizens’ rights, the financial divorce bill.